K-I-S-S-I-N... Well, maybe if we were sitting on the same branch we would be kissing. As it is, daddy is checking out the view from the branch above mine. Our five chickens can't really fly so they sit on the lowest perch while Naiya watches us all with feet (or foot?) planted firmly on the ground. Ryan has been purging his closet and drawers and yesterday handed me a stack of old t-shirts. It's hard for me to just toss these out or even to hand them off as a donation. It seems to me like they could be put to good use in our home somehow. For rag dolls maybe? Or even just for rags. Some of the lesser castaways were converted into just that but then Naiya came along as I was cutting and asked if she could use some scraps for herself. We made her a few bracelets and headbands from the collars and sleeves as well as a sheet for her doll bed. Then I laid them out on the ground, stared at them for a while and let the ideas come. "Why, there's a whole simple outfit right there!" I thought. Five minutes later (literally) Naiya had on her new knit skirt and blouse. She looks a bit the ragamuffin and I think both skirt and shirt could be cut shorter but it's good to know that, should an emergency arise wherein I have two expendable t-shirts on hand and my child needs to be clothed, there are options! Mostly, I just thought it was a nifty idea. To make the skirt I just ran a bit of elastic through the existing bottom hem of the shirt. For the blouse, I cut off the two bottom t-shirt corners in a curved shape for the arms (one could lay an existing shirt for a pattern but I just eye-balled it). Then, using strips of the other shirt, I ran a strap through the front and one through the back of the existing bottom hems. These were then gathered and tied to each other at the shoulders. It took, in fact, less than five minutes. Ryan had this funny idea recently to let a patch of our side lawn grow wild. He just wanted to see what would happen. I don't know if you can tell in the photo but there's this organically shaped swathe of foot high seeding grass, clover and some sweet little yellow flowers out there that we've taken to calling our meadow. I'm not sure how the neighbors feel about this. (Perhaps they figure our lawn mower broke.) Our bee friends, of course, absolutely love it. Since we're regular users of a push mower, I think Ryan likes that there's just a little less work to do. Come to think of it, maybe that's why he made the suggestion in the first place. What Naiya really loves are the tall stalks of seeds. I don't know if she thought up this verse herself. My guess is it was something she heard at school. She begins by holding up a stalk which does, indeed, look like a tiny tree. She then runs her free hand up the "trunk" of the tree effectively removing all of the "leaves". Then she sprinkles the removed "leaves" down over the tree. "And here is the silver rain," she concludes. She spends a moment to find another stalk and delights in the transformation again and again. When Naiya was just a baby and I read books to her more for my own entertainment than for her edification, I began to notice the lack of girls (or female characters, animal, person or otherwise) in children’s literature. At first I thought it must just be my particular selection of books, but as our library expanded and I made a concerted effort to acquire stories about or including female characters, I discovered that the deficiency was pervasive. Dare I say that the omissions began to feel sinister? I couldn’t believe that the choice of the masculine pronoun for almost every animal that wasn’t a mother and nearly every character who played an active role in the advancement of the simplest plot was intentional by the authors of even the most beautiful of stories. Of course, it is part of our language to refer to the unknown in the masculine. I hadn’t reflected upon it much before, but I soon began to notice that every bird, squirrel, spider, slug and cat we saw as we encountered them on various walks and hikes around our neighborhood were referred to, almost without exception, as “he” or “him” by all of the adults present, including myself. No one gave it a second thought. Out of curiosity, I began charting the books we owned as well as those I checked out from the library. This wasn’t a scientifically random study or anything, but I found that for every female in children’s literature, there were, on average, two to three male characters sharing the pages with her. If the roles of mothers and grandmothers were excluded from the female list, that number doubled! So what does this mean (if it means anything at all)? The more I considered it, the more profound and important it began to seem. Children learn by imitation. This is a basic tenet of modern psychology and an important part of Waldorf education. Children learn and grow by imitating the adults in their environment that they love and respect. (They likewise, but to a lesser degree, imitate their friends and siblings and any person who randomly makes a strong impression upon them.) The cultural knowledge and behavior of children also comes from the activities and impressions that influence them on a daily basis. Books and stories, for many children, are an integral part of modeling morality, basic behavior and gender roles. So what happens consciously and unconsciously, especially for small girls, when they are so under-represented in the books they read and love? Numerous studies analyzing children's literature find the majority of books dominated by male figures. For example, Ernst (1995) did an analysis of titles of children's books and found male names represented nearly twice as often as female names. She also found that even books with female or gender-neutral names in their titles in fact, frequently revolve around a male character. Many classics and popular stories where girls are portrayed usually reflect stereotypes of masculine and feminine roles. Such gender stereotypes are prevalent not only in mainstream children's books but also in Newbery and Caldecott medal winners. Children's books frequently portray girls as acted upon rather than active (Fox, 1993). Girls are represented as sweet, naive, conforming, and dependent, while boys are typically described as strong, adventurous, independent, and capable (Ernst, 1995; Jett-Simpson & Masland, 1993). Boys tend to have roles as fighters, adventurers and rescuers, while girls in their passive role tend to be caretakers, mothers, princesses in need of rescuing, and characters that support the male figure (Temple, 1993). Often, girl characters achieve their goals because others help them, whereas boys do so because they demonstrate ingenuity and/or perseverance. If females are initially represented as active and assertive, they are often portrayed in a passive light toward the end of the story. Girl characters who retain their active qualities are clearly the exception (Rudman, 1995). Thus, studies indicate that not only are girls portrayed less often than boys in children's books, but both genders are frequently presented in stereotypical terms as well. Many researchers and authors argue that readers identify with characters of their own gender in books. Therefore, the relative lack of girl characters in texts can limit the opportunity for girls to identify with their gender and to validate their place in society. The manner in which genders are represented in children's literature impacts children's attitudes and perceptions of gender-appropriate behavior in society. Sexism in literature can be so insidious that it quietly conditions boys and girls to accept the way they 'see and read the world,' thus reinforcing gender images (Fox, 1993). This reinforcement predisposes children to not question existing social relationships. At the same time, however, books containing images that conflict with gender stereotypes provide children the opportunity to re-examine their gender beliefs and assumptions. Thus, texts can provide children with alternative role models and inspire them to adopt more egalitarian gender attitudes. Gender stereotypical roles are constraining to both genders. Just as girls are trapped in passive and whiny roles, boys and men are rarely described as people demonstrating emotions of sadness and fear, having hobbies/occupations that are not stereotypically male and in roles where they aren't competing or meeting high expectations. These stereotypes limit boys' and girls' freedom to express themselves (Fox, 1993; Rudman, 1995) and pressure them to behave in ways that are 'gender appropriate' rather than ways best suited to their personality. There is much that I do to ensure that my daughter grows up in an environment of freedom. The way we play, the way we create, the absence of media and adult influences in her life are all a part of just allowing her to become herself without many external dictates. These days when I tell stories or perform puppet shows for Naiya, nearly all the characters are female. Likewise, when I refer to critters and furry friends we spot on our outdoor adventures, they’re all “she” or “her”. (Since everyone else pretty much exclusively uses the masculine pronouns I figure together we’re creating a balance that is more accurate.) What though of our love of books? It’s not that this issue hasn’t been addressed. We have come across a number of really great collections of tales of powerful, mischievous, adventurous girls and women (though these are mostly for older children). But they are certainly the exception and they’re marketed as just what they are. What hasn’t really shifted is just a general inclusion (without specific marketed mention) of more girls (and more bold and active girls) in mainstream little stories. Even our favorite nighttime reading (written by a wonderful Waldorf teacher) contains the ratio of feminine to masculine characters I mentioned above. I’m not sure what to do with this knowledge. I have mentioned these statistics to friends of mine and nearly everyone is surprised at their own unconscious creation of a world that is inaccurately 70 - 80% male. I guess I’d just like to spread a bit of awareness. Perhaps together, we’ll alter our biases just a little at a time and, in so doing, help our daughters (and sons) see and live in a world less shackled by our own limiting vision. It's like I'm living in some alternative world. I don't know exactly how this occurred but as I was putting away dishes and making myself a cup of coffee just now, Naiya came in for second breakfast. Only this time she didn't say, "Mommy, I'm hungry...what can I have?... Mommy, get my dish... Can you pour the juice?... Mommy, I need a napkin..." Instead she pulled her kitchen stand over to the cupboard, found a bowl and a cup, put them on her shelf near the floor, poured a bowl of cereal, opened the refrigerator and filled both bowl and cup with milk, got a spoon from the drawer and walked outside to enjoy her meal in the garden. I watched her silently dumbfounded through the entire process. She didn't even look at me! In the Summertime there's a lot of fairie activity in our garden. They return from wherever it is that they winter right around May Day and spend the warm months frolicking and holding festivals under the ferns and arborvitae in our back yard. We rarely actually see them but their presence is obvious. Many of the received treasures have been gifted to friends and family but various carved stones, beads, fairie handcrafts and shells are kept by our dear daughter in a special little basket on her Nature Table. Our spritely friends don't seem to be there all the time. In the mornings we sometimes see that they've had pretty spirited parties but other times they're gone for days on end. Often on nights when they return, they'll bring something to expand their ever-growing village and in the morning Naiya will delight in the new additions. Sometimes a good idea is had by two friends at the very same time. My dad is a Master Gardener and sometimes gets invited to special events around the Portland Metro area. Last week Naiya and I joined him and my mother on a tour of Laurel Hedge in Estacada. I like to post about places like this to highlight things to do in our local area (this private garden is open for viewing on Saturdays from 10-5) but also, there were so many interesting gardening ideas here that I thought all you folks far, far away might enjoy a virtual tour for your own outdoor inspiration. Ten years ago this two acre property was a Christmas tree farm with nothing on it but rolling hills of rows of trees and an old farmhouse. In just a decade two guys (with no one else's assistance) turned the property into the sometimes quirky, ever so creative, gorgeous garden seen here. These guys are also landscape designers. It seems this garden (which surrounds the updated farmhouse where they now live) is more a hobby and labor of love than anything else. They use a lot of found objects to create fun and magical spaces. I think the glass doohickies on top of the rebar are antique utility pole insulators. In several places there is interesting use of pressed metal scrap. This sweet little "cottage" is a working outhouse complete with chandelier and running water. Remembering that just two people converted all this land, a pond this size is quite impressive. There are cool unorthodox elements like this up-cycled door archway throughout the garden. I like the stacking of stones. The large galvanized tub is one of many water features spread throughout the grounds. And, of course, I had to get a shot of my lovely girl enjoying it all. She's something of a outdoor tour aficionado with all the garden and farm visits we do throughout the year. Since part of what I do here in blogland is just keep a record of my lovely daughter as she does what she does and grows and changes each day, sometimes I like to record what's happening in her art. Oddly, she's not in the past gotten very excited about drawing or painting. I say oddly because I have presented an active opportunity for these things nearly every day since she was quite young and there are passive permanent areas in our home where she can color and draw any time she'd like. Until a few moths ago, she mostly hadn't. 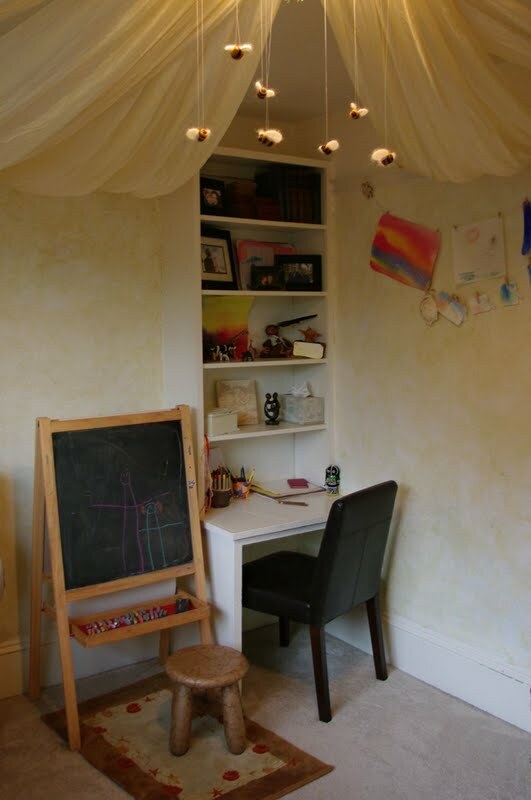 We did recently move the playroom and this new space has a kind of built-in desk where, right next to her chalk board, we set up her crayons and an array of papers and colored pencils in a more organized and inviting way. Since then, she has embraced chalk drawing and coloring more frequently. I don't know if I'd label her an art enthusiast just yet but I'd say we're moving in that direction. Where she used to tire of these sorts of activities in less than three minutes, now she enters into them in her free play time and will sit with crayon or chalk for sometimes ten or twenty minutes before she excitedly comes to share her latest masterpiece. What I never have done much of is instruct. I draw and paint alongside her but I don't mandate or advise her on her work. I also try to generally stay away from coloring books and pre-made pictures. From the beginning, it has been fascinating to me just to see what she'll do on her own; for her to explore color and form from her own hand, through her own movement, thought and imagination. Anyhow, recently in her figure drawings, The People Have Legs. This one is Naiya and her daddy. (They used to look like this.) It's new and I don't know what this really means developmentally. There's probably a book out there somewhere that explains exactly what is happening in the child's consciousness, development and perception of the world when this remarkable transition takes place. Who am I kidding? There are probably several such books. To me it's just enchanting and I'm endlessly intrigued by what her little hands, heart and mind produce. Anyhow, I remember once making a huge multi-wicked sand candle with blue wax when I was very young. I got to carve a shape in a big box of sand, help put in the wicks and pick the color wax I wanted. I had that candle for years and would never light it because I wanted it to last forever. When I was trying to think up crafts suitable for Summer this recollection came to me. I figured working with sand was seasonally appropriate and thought Naiya and I could do this one together. We started small. The candle seen here that we made was much less funky and tiny compared to the one I recall. Partly this was due to not being overly familiar with candle making. Mostly though, we kept it small and simple because we didn't have very much wax to work with. When I get my hands on another block of beeswax we'll go for a larger, hand sculpted, more elaborate design. We then used a small vase to make our candle shape. One could use just about any object to form the basic shape or, as I did as a child, sculpt the area by hand to create a more organic form. After our mold was ready, we began preparation of the wax. Of course, one can recycle old candles for this step of the process or, as we did, use a block of beeswax. I don't know if it was necessary to grate the block into smaller shavings but it certainly cuts down on the melting time. To figure out how much wax we'd need, we poured water in the vase we used to make the mold and then got an approximate volume by pouring that water into a measuring cup. This was about a 4 ounce candle. I placed about double that amount of shavings into a double boiler (because the shavings dissolve into an smaller volume) and heated the wax until it had melted. I had wick and wick button ready to go and dipped them into the melted wax and then into cold water. Then I used my fingers to straighten the string. If the wick is still wiggly, this process can be repeated until some stiffness is established. This step can be skipped and the wick button isn't completely necessary. I just find that creating some stability in the wick makes for an easier time in the following steps. We then placed the wick in the center of our mold and attached it with tape to a ruler (any stiff object that spans the container would do) to hold it in place. That's pretty much it until the candle solidifies. This tiny one took less than an hour. Naiya was thrilled to pull it out of the mold and even used her own scissors to trim the wick (leaving 1/4" - 1/2" sticking out). We'll use this as our story-time candle and hope to find some tales of sand and sea to accompany our beachy creation. In the Spring I did a book post that a few folks found useful so I thought I'd share a list of our Summer stories as well. Most of these are standard fare in the Waldorf community. If that's where you reside, there are likely few surprises that follow. Of all the seasons I have found that, oddly, our Summer collection is the smallest. If you have favorites of your own, please share them in the comments. I'd love to hear your suggestions and expand our current repertoire. Since the season is just upon us, we're especially enjoying these first two books . 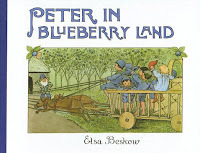 Peter in Blueberry Land by Elsa Beskow is a century old classic wherein Peter goes out looking for blueberries for his mother's birthday and falls into a magical miniature adventure with the help of the King of Blueberry Land. 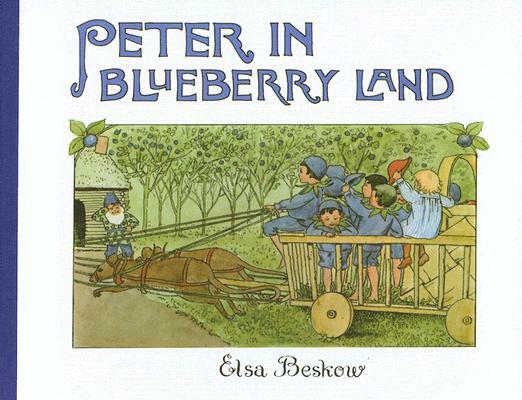 As with all of Elsa Beskow's books, the story and the telling are comfortingly gentle and sweet and the illustrations are, like the tale, magical with their soft, beautiful watercolors in the art nouveau style. Blueberries for Sal by Robert McCloskey is a somewhat more modern but still classic Caldecott story of Sal and her mother going gathering on Blueberry Hill. Just as they begin their picking, Little Bear and his mother come to fill their tummies with berries as well. Of course there is no gruesome encounter of the pairs but just a sweet crossing of paths. 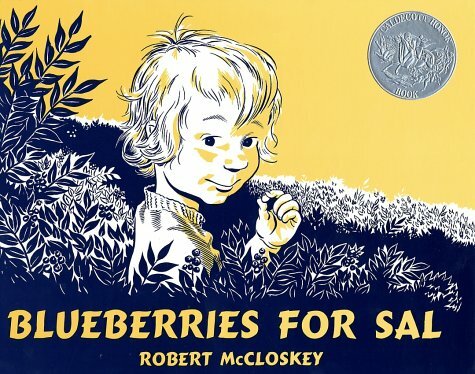 What Naiya and I especially enjoy in this one are the opening and closing block print illustrations of Sal and her mother canning their delicious cache in their classic 1950's kitchen. 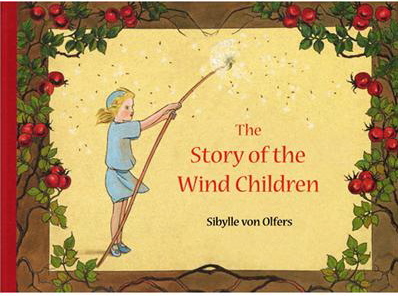 The Story of the Wind Children by Sibylle von Olfers is a late Summer tale that transfers in September to our Autumn basket as well. In it little George is playing with his boats by the lakeside but despairs when no wind comes to make them sail. He and his vessels are saved by a wind sprite who blows them across the lake and then proceeds to take George on a number of playful adventures. Since reading this one, Naiya has begun calling dandelions by the delightful name of "fairy clocks". So sweet. Flower Fairies of the Summer is one of a series of books by Cicely Mary Barker that I have mentioned before. 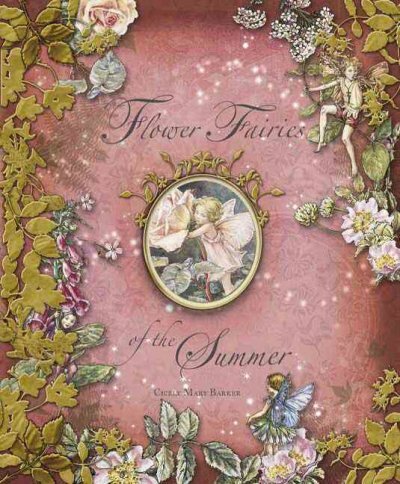 It's a collection of poems and strikingly accurate illustrations of about twenty common summer flowers. Although Ms. Barker was English and so penned what was typical and familiar in her part of the world, we here in the Pacific Northwest reside at a similar latitude and enjoy nearly the same climate as her merry old country and so luckily find similar foliage in our gardens and natural spaces. In addition to loving the rhymes and fairy pictures, we often use these books for identification purposes. 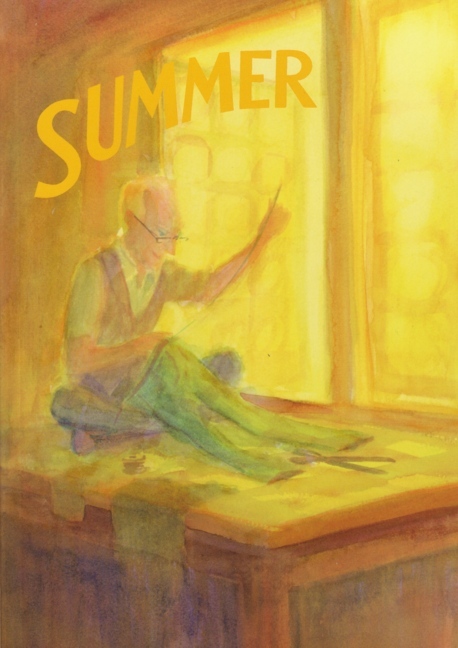 Summer is another in a compendium of six books from Wynstones Press. It contains a variety of songs, poems and stories of the season collected from various authors. We like to use its tales and verses as inspiration for our daily puppet shows and play at our Nature Table. It even contains special, hard to find narratives for Whitsun and the Day of St. John. 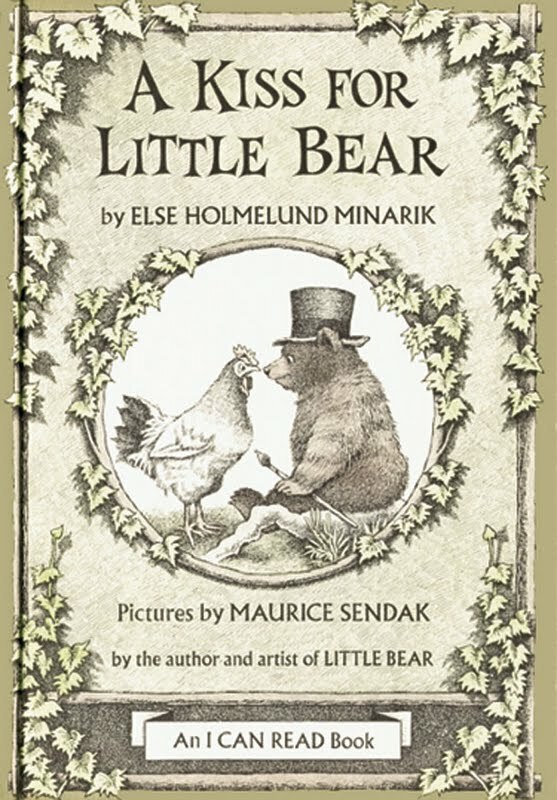 A Kiss for Little Bear by Else Holmelund Minarik with illustrations by Maurice Sendak isn't really a Summer story at all but it is one of a series of books we're currently enjoying that we only recently discovered (so I thought I'd share it anyway). It's a really sweet tale of a kiss being passed from one animal friend to another as it makes its journey between Little Bear and his Grandmother. We've turned this one into a staple at puppet show time and Naiya especially likes to gather up all her animals and act out the passing of the kiss from one to another before the festive wedding arrives at the end to finish the fun. In the Summertime we tend to engage in much more outdoor play than craft creation but in the evenings I do sometimes manage to put together a few small projects. This week Naiya and I were noticing the bees and spiders flourishing in the gardens and farms and while laying on our backs in the playroom one afternoon, we talked about bees coming to harvest nectar from the wreath of flowers hanging around the ceiling silks. While she was sleeping one night I assembled seven buzzing little critters while listening to my favorite hot weather tunes. They took about ten minutes each and are a great first time project for those who have yet to try a hand at needle felting. Begin by tying a three to four inch length of the yellow wool into a knot and then wrapping the excess around that knot to form an elongated ball. Using the felting needle, poke at the ball until the loose bits of wool are held into place. Take some small wisps of black wool and roll them into a thin strands with the heels of your hands to create two three to four inch lengths for the stripes of the bee. Roll another fluff of black wool with the heels of your hands into a small ball to create the "face" of the bee. Needle that ball until flattened onto one end of the bee. Take a thick quarter sized bit of white wool and again rub it into its basic wing shape using the warm heels of your hands before then placing it onto the felting pad. On the pad, needle the wings until that they become somewhat flat. The wool will be stuck to the pad a bit. Gently pry it up, turn it over and needle the other side. The wings will be a bit fuzzy having been stuck to the pad. This adds to the soft and dreamy nature of all things felted I think and is perfectly alright. To make the little critters more personable I also needled on tiny eyes. I hung them from threads and the swarm took off around the flowers hanging in the playroom from the ceiling silks.